Paññā (Pāli) or prajñā (Sanskrit) "wisdom", is insight in the true nature of reality, namely primarily anicca (impermanence), dukkha (dissatisfaction or suffering), anattā (non-self) and śūnyatā (emptiness). Prajñā is often translated as "wisdom", but is closer in meaning to "insight", "discriminating knowledge", or "intuitive apprehension". Pra is an intensifier which could be translated as "higher", "greater", "supreme" or "premium",[web 2] or "being born or springing up", referring to a spontaneous type of knowing. 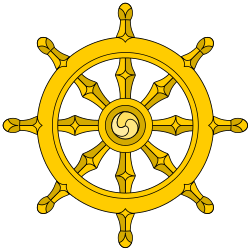 Paññā is the fourth virtue of ten Theravāda pāramitās, and the sixth of the six Mahāyāna pāramitās. In the Pāli Canon, paññā is concentrated insight into the three characteristics of all things, namely impermanence, suffering and no-self, and the four noble truths. In the 5th-century exegetical work Visuddhimagga, one of the most revered books in Theravada Buddhism, Buddhaghoṣa states that the function of paññā is "to abolish the darkness of delusion". In Mahayana Buddhism, the importance of prajna was stressed in combination with karuna, compassion. It took a central place in the Prajñā-pāramitā Sutras, such as the Heart Sutra. Prajna is spoken of as the principal means of attaining nirvāna, through its revelation of the true nature of all things as emptiness. ↑ Keown 2003, p. 218. 1 2 Loy 1997, p. 136. ↑ Buddhaghosa & Ñāṇamoli 1999, p. 437. ↑ See, e.g., Monier-Williams (1899), "jña," p. 425 (retrieved 14 Aug. 2012 from "Cologne U." at http://www.sanskrit-lexicon.uni-koeln.de/scans/MWScan/MWScanpdf/mw0425-jehila.pdf).